Dusk... and Her Embrace is the second studio album by English extreme metal band Cradle of Filth. It was released on 19 August 1996 and is their first release on the label Music for Nations. This was a bit of a weird one. We actually recorded it as our second release, but we then had to take our label to court which meant that most of it was temporarily lost for legal reasons. The next thing I know the band had split into two-halves, and after releasing the V Empire EP my half was able to re-record and finally release the album. In a way it actually worked in our favour, because after nearly two years of legal battles and non-stop hassle I think the troubles of the times actually came through on the recording. We actually worked with Kit Woolven on that one, who most people knew from working with Thin Lizzy, so it had a very lush edge as well as this distinctive, dark vibe. To this day this is the album that a lot of our fans seem to be really drawn to. And it catapulted us into a whole new world. Being segregated from mainland Europe really divided us [from that scene], and over time we felt more and more alienated from it. The result was that Dusk and Her Embrace was a quintessentially British album. It was just what felt right. I grew up on Hammer Horror... and we were very much also immersed in the history of witchcraft in Suffolk. There's a lot of spiritual mythology and hauntings in that area, and we channelled that into the album, which is why it has that sort of vampiric feel to it. The album climaxes with a guest speech from Venom's Cronos on the final track, "Haunted Shores". Dusk and Her Embrace was released on 19 August 1996 by record label Music for Nations. It charted just outside of the UK top 100, at 107. Critical reception of this album has been generally positive. AllMusic wrote: "Dusk and Her Embrace may be [Cradle of Filth's] finest moment." All lyrics written by Dani Filth; all music composed by Cradle of Filth except "Hell Awaits" by Jeff Hanneman and Kerry King. Cronos – vocals on "Haunted Shores"
We reached a deal with Cacophonous whereby they got another recording from us [V Empire], and in return they agreed to cease the dispute we'd become entangled in with them. The material that we'd demoed for Dusk and Her Embrace needed the space and attention of a full album, so we saved it. The original recordings of Dusk – which were literally just sat gathering dust on someone’s shelf – are actually going to see the light of day. It’s going to be a really cool part of Cradle history, and obviously they’ve never been heard before by anyone. The title for the new release was Dusk... and Her Embrace: The Original Sin. It was released on CD and digital on July 8, 2016. A vinyl version, limited to 666 copies, followed on October 10 the same year. The liner notes confirm that the lineup for this version was almost the same as for The Principle of Evil Made Flesh, including Paul Allender, Paul Ryan and Benjamin Ryan, but excluding Robin Graves, who was shortly replaced by Jon Kennedy. Allender, the Ryan brothers and Kennedy all left the band before the 1996 version of Dusk... was recorded. Steve Grimmett – vocals ("Arthurian Wails") on "Haunted Shores"
Cronos – vocals ("Rabid Captor of Bestial Malevolence") on "Haunted Shores"
^ a b Torreano, Bradley. "Dusk and Her Embrace – Cradle of Filth: Songs, Reviews, Credits, Awards: AllMusic". AllMusic. Retrieved 11 August 2012. ^ Meloon, Brian (2 January 1997). "CoC : Cradle of Filth – Dusk and Her Embrace : Review". Chronicles of Chaos. Retrieved 27 August 2012. ^ Christe, Ian (May 1997). "Metal". CMJ New Music Monthly. CMJ Network, Inc.: 48. Retrieved 30 August 2012. ^ Palmerston, Sean (August 2001). "Cradle of Filth – Dusk And Her Embrace • Metal Reviews • exclaim.ca". exclaim.ca. Retrieved 11 August 2012. ^ Schinzel, Drew (4 September 1997). "CoC : Cradle of Filth : Interview : 4/9/1997". Chronicles of Chaos. Retrieved 8 September 2012. ^ "Chart Log UK: Chris C. - CZR". zobbel.de. Archived from the original on 7 May 2012. Retrieved 2010-11-07. ^ "Cradle of Filth - Dusk & Her Embrace (album)". Finnishcharts.com. Media Control Charts. Retrieved 2014-04-26. ^ Sharpe-Young, Garry (31 March 2007). "Cradle of Filth | Unique, Detailed Biography | Rockdetector". Rockdetector. Archived from the original on 30 September 2007. Retrieved 25 June 2013. ^ "Cradle of Filth - Finally, the wait is over! The release... | Facebook". www.facebook.com. Retrieved 2016-05-10. 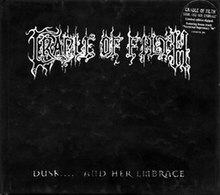 ^ "Cradle of Filth - 'Dusk... And Her Embrace - The Original Sin' now available on vinyl". 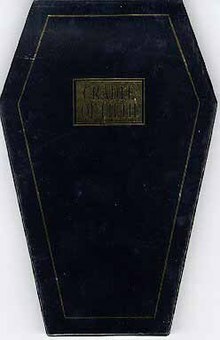 www.cradleoffilth.com. Retrieved 2017-08-11. This page was last edited on 9 March 2019, at 13:59 (UTC).